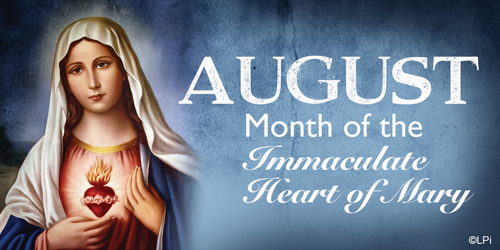 August is a month dedicated to the Immaculate Heart of Mary. Pope John Paul II encouraged devotion to Mary in his Apostolic Letter Rosarium Virginis Mariae. St. Augustine said of Mary "she cooperated through charity in the work of our redemption". Devotion to the Heart of Mary began in the Middle Ages under Anselm of Canterbury, and Bernard of Clairvaux. It was further developed by Mechtild, Gertrude the Great and Bridget of Sweden. St. John Eudes (d. 1681) propagated the devotion, and made it public. Pope Pius XII instituted the feast of the Immaculate Heart of Mary in 1944 to be celebrated on the 22nd of August. In 1969, Pope Paul VI moved the celebration of the Immaculate Heart of Mary to the day, Saturday, after the Solemnity of the Sacred Heart of Jesus. Pope Paul VI moved the celebration of the Queenship of Mary from 31 May to 22 August. Our Lady of Fátima asked that, in reparation for sins committed against her Immaculate Heart, on the first Saturday Catholics go to Confession (within eight days before or after the first Saturday), receive Holy Communion, recite five decades of the Rosary, and keep her company for 15 minutes while meditating on the 15 mysteries of the Rosary. She promised that, whoever would ever do this, would be given at the hour of his death the graces necessary for salvation. I, (name)_____, a faithless sinner, renew and ratify today in thy hands the vows of my Baptism; I renounce forever Satan, his pomps and works; and I give myself entirely to Jesus Christ, the Incarnate Wisdom, to carry my cross after Him all the days of my life, and to be more faithful to Him than I have ever been before. In the presence of all the heavenly court I choose thee this day for my Mother and Mistress. I deliver and consecrate to thee, as thy slave, my body and soul, my goods, both interior and exterior, and even the value of all my good actions, past, present and future; leaving to thee the entire and full right of disposing of me, and all that belongs to me, without exception, according to thy good pleasure, for the greater glory of God in time and in eternity. O admirable Mother, present me to thy dear Son as His eternal slave, so that as He has redeemed me by thee, by thee He may receive me! O Mother of mercy, grant me the grace to obtain the true Wisdom of God; and for that end receive me among those whom thou lovest and teachest, whom thou leadest, nourishest and protectest as thy children and thy slaves. O faithful Virgin, make me in all things so perfect a disciple, imitator and slave of the Incarnate Wisdom, Jesus Christ thy Son, that I may attain, by thine intercession and by thine example, to the fullness of His age on earth and of His glory in Heaven. Amen. Immaculate Heart of Mary, full of love for God and mankind, and of compassion for sinners, I consecrate myself entirely to you. I entrust to you the salvation of my soul. May my heart be ever united with yours, so that I may hate sin, love God and my neighbor, and reach eternal life together with those whom I love. Mediatrix of All Graces and Mother of Mercy, remember the infinite treasure which your Divine Son has merited by His suffering and which he has confided to you for us, your children. Filled with confidence in your motherly heart, and for the sake of the Sacred Heart of Jesus, obtain for me the favor I ask: [Mention your request here].